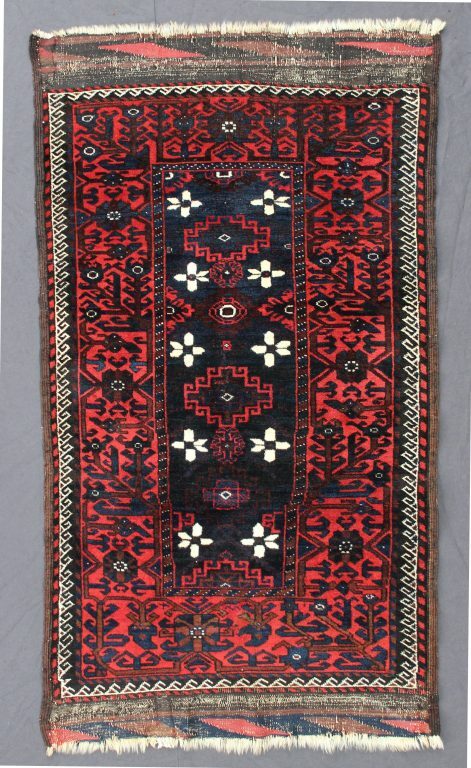 This Balouch rug dating to the third quarter of the 19th century has great presence. The central column of Memling guls is set in a dark field which, at closer inspection, reveals a multi-layered structure of dark blue and off-black colours producing a sense of depth which is not usually found in later carpets. The white flower heads in the field are alternately facing inwards and outwards. Also notable is the idiosyncrasy in the shape of the field, which, in the bottom half, is stepped twice on the right-hand side to make it wider. The unusually wide main border, nearly as wide as the field, adds to the great impact of this almost archaic piece. It is made with the most lustrous wool and deep, saturated colours and has retained its original kelim ends.